Aerojet Rocketdyne has developed four engines that will support NASA‘s maiden flight for the Space Launch System. The company said Wednesday that the RS-25 engines are now ready to be integrated on the SLS rocket’s core stage in preparation for the Exploration Mission-1 mission. “These four EM-1 engines have … powered 21 shuttle flights with the most experienced engine, E2045, having flown on 12 separate flights,” said Dan Adamski, RS-25 program director at Aerojet Rocketdyne. Eileen Drake, Aerojet Rocketdyne president and CEO, said that the SLS propulsion system represents the development of EM-1 and the country will soon launch the new capacities that aim to help humans explore deep space. EM-1 will launch the Orion spacecraft into an orbit around the moon as well as deploy 13 small satellites in deep space. 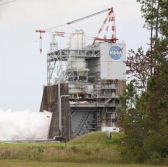 Aerojet Rocketdyne will store the RS-25 engines at NASA’s Stennis Space Center prior to its integration with the core stage currently under development at the Michoud Assembly Facility in New Orleans.